Unceasing advances in the development of hybrid and all-electric vehicle technology continue to pose new challenges for the automotive sector. The high-voltage (HV) battery has long been considered to be a “black box”. But now, more and more manufacturers are also venturing into repairing HV batteries. This involves lots of challenges and requires a special understanding of “overall systems” in order for proper work to be possible. 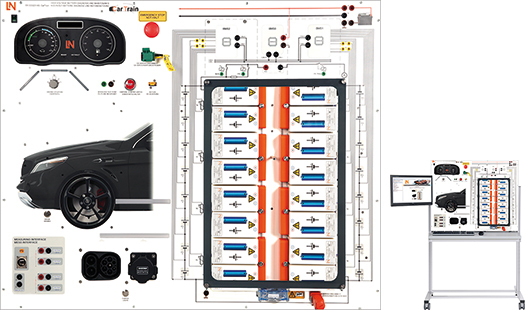 This training system focuses on the digitally networked CAN-bus battery management system in a traction battery and on the corresponding components. Particularly important here were the activities involved in the measuring and operational testing of HV components carrying a voltage. Practical and live exercises involving the measurement and diagnosis of battery cells are carried out. The HV battery is designed such that it can be taken apart to replace individual cells and sensors. This is how the trainee develops skills and practices diagnosing and maintaining the HV battery.